Dry Eyes : One common side effect of wearing contact lenses is developing dry eyes. This condition results from having insufficient tears. Dry eyes can occur in wearers of soft and hard contact lenses, alike. People with dry eyes might experience symptoms such as the eyes feeling hot, a sensation of something stuck inside the eye, redness, and burning or tearing. Fluid deposit : Intraocular fluid from the lens gets deposit on the retina. This fluid can lead to eye infections. This is more common when you wear soft lenses daily, as they are flexible and the fluid doesn’t come out easily after washing with the solution. Burning eyes : When you try to set these plastic or silicon lens inside your eyes, you feel a burning sensation instantly. Eyes are very sensitive. If a small dust particle enters, it becomes red. What will happen when you try to put lens? The inflammation is felt but, it is temporary. You can also get bumps on the eyelids and these swollen eyelid are painful. 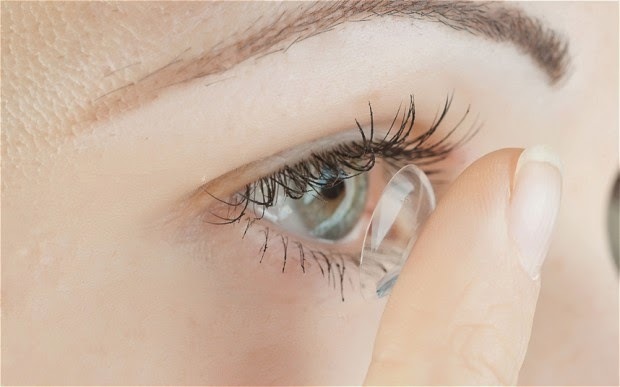 Pressure on the Eyes : Contact lenses exert a certain amount of pressure on the eye. Depending upon the fit and oxygen permeability of your lens, this pressure can change the shape of the cornea. Allergic Reactions : The chemicals used in the cleaning, disinfecting and lenses storage solutions may irritate sensitive eyes. Giant Papillary Conjunctivitis (GPC) is a particular allergic condition that is often due to chemical allergies and protein build-up on contact lenses. Symptoms include small bumps on the inside of an eyelid, mucus and itching.